Hydra tried to knock us down, but couldn't knock us out! Internet problems have been conquered and here's out new episode! 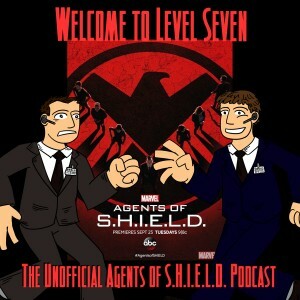 Although, Ben seems to have watched the episode while Daniel was reading a book…and Daniel makes the most amazing episode analysis in the history of Welcome to Level Seven! Well, to begin with, I thought this episode was a MILLION TIMES BETTER than the first two were. And Ben, I think you hit the nail on the head in the podcast – the first two episodes of AoS, for me, just *weren’t* enjoyable. And I think it was because that family dynamic was seriously lacking! I know people like action, but I have always appreciated that AoS has been character-focused, as well as action-y, and I felt the absence of that in the first two episodes. I was really hoping that wasn’t the new direction of the series. With this episode, my confidence in the showrunners has been boosted. In conclusion, I think that what has tied me most to AoS each week is my emotional involvement with the characters, their relationships with one another, and their growth as people. If that was going to be ripped apart, there wasn’t going to be much keeping me invested in the story. But this episode reassures me that the last two episodes have probably been more of a blip than the new normal. And this episode didn’t have the same heavy, depressed feeling as the last two. We are just thrilled to hear you are sticking around! We need all the Agents we can get in this battle against Hydra. PS – All the quotes from How to Make Friends and Influence People were hysterical. You guys are totally my favorite AoS podcast. You are so much fun to listen to!